SHF #23: Lemon Muffins - Do You Know The Muffin Man? Alanna is hosting this month's Sugar High Friday event and the theme is surprise (surprise!). Now a surprise isn't something you usually want when baking or eating. No one likes to find out that she has forgotten to add the sugar when putting a tray of cookies into the oven, or discovering a large metal staple in their plate of noodles (this actually happened to me). But sometimes, surprises can be welcome, for example, unexpected flavour combinations that work well together, or ordering sparkling water and getting champagne instead (this has never happened to me). The muffins I made for this event are adapted from a recipe in Caprial's Desserts by Caprial Pence and Melissa Carey. 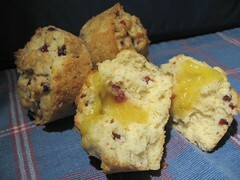 The authors suggest a muffin that has some lemon curd injected into the centre. To the basic batter, I added some finely chopped cranberries and lemon zest to punch up the flavours a bit more. Pulling out a pastry bag seems like a lot of work to make a simple breakfast item, but it's the easiest way to fill the centres with curd. However, if you try this, make sure you don't plunge it too deep. One of the muffins offered its own surprise: it had a cylindrical, curd-filled tunnel from top to bottom! If you make this, I suggest reserving some of the batter to cover the opening, rather than trying to smooth the top as the recipe describes. The muffins were a little bit dry, but the lemony filling was quite tasty, tart and sweet at the same time, providing a bit of moisture and contrast as well. I think I might explore the idea of putting a filling into muffins some more, maybe jams or pieces of fruit.